JFall 2016: "What developers should know about design"
JavaOne 2016: Wednesday, Sep 21, 8:30 a.m. - 9:30 a.m. In this whitepaper we discuss the specific advantages of Vert.x and present an overview of the different functionalities of the framework. GOTO Amsterdam 2016: "What developers should know about design"
Workshop at the Sogeti Open Source bootcamp weekend on the basics of the JVM language Kotlin. Presentation at Equens about the interrelations and benefits of DevOps, Microservices, containers and cloud. Activiti is an open source workflow and BPM platform built in Java. In has a BPMN engine which allows you to create business flows in diagrams and execute them as part of your application. Activiti integrates really well with the Spring Framework. 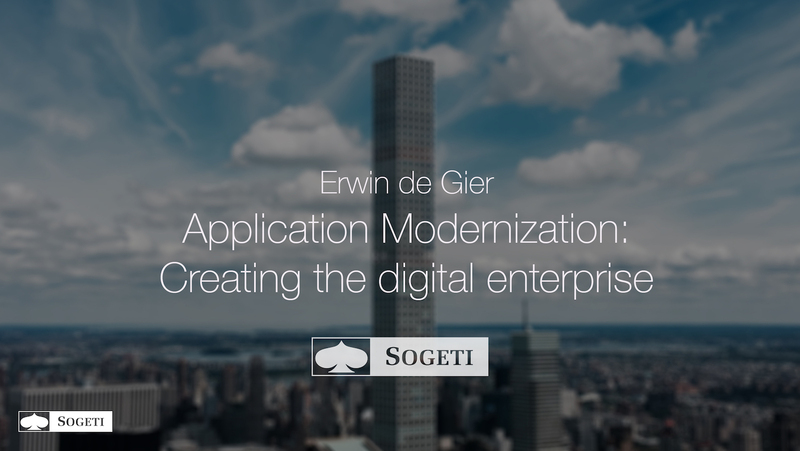 Combining it with Spring Boot allows you to build micro business process applications really quickly. Vert.x is my favorite JVM framework of recent years. And since I discovered Kotlin, it’s becoming my favorite JVM language. So you can probably guess how happy I was when I discovered the kotlin language bindings for Vert.x! Because of the nice syntactic sugar, Kotlin makes Vert.x code a lot more readable. You want to start using the hot new JVM language Kotlin today, but you are knee-deep in a Java project and you cannot switch languages. Why not start using Kotlin for writing unit tests? Kotlin is Java compatible and can be used together with Java in the same project. Let’s have a look at how to accomplish this. This month, the 1.0 version of the new JVM language “Kotlin” was released. Kotlin is 100% compatible with Java and can be used along side it. It is an object oriented language with functional properties. There are plenty of quick starts available, but what are the killer features that would make you choose it over the trusty old Java? In this example we will build two MQTT clients in Java, one publishing messages and one consuming messages. We will make use of the public broker MQTT Dashboard. Article in Open Source Java Newspaper about microservices, event-driven applications with Vert.x. 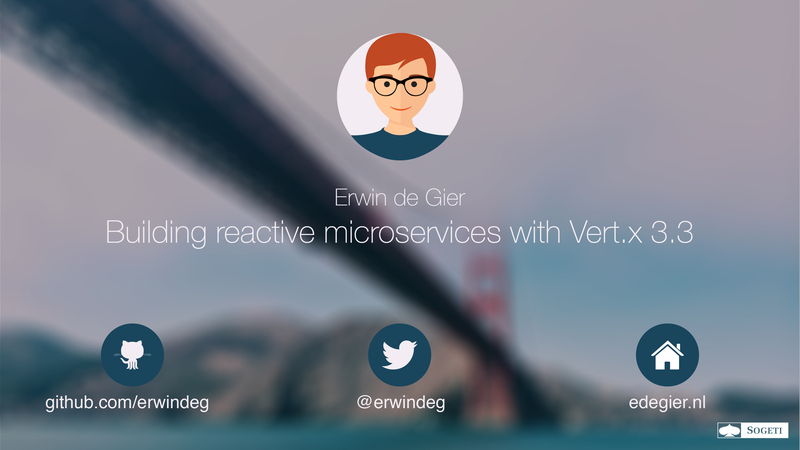 Presentation introducing Vert.x for building reactive, event-driven applications on the JVM in Java. Workshop at the Amsterdam University of Applied Sciences with Livia Rickli which shows wireframing as a powerfull tool for creating mobile application concepts. Short introduction to the six principles of influence of Cialdini. Presentation describing the changing demands for software and the reacting concepts to fulfil these demands. This presentation was an introduction to the Vert.x 3 presentation of Paolo Lopes. Describing the new features of Vert.x 3 at the JFall conference 2015. Presentation introducing the interesting graduation assignments done at the Sogeti Java Business Line. In this live coding demo a realtime webapplication was build with Vert.x, MongoDB, AngularJS and websockets. Building a chat application at the Sogeti Java Bootcamp with Vert.x, AngularJS and MongoDB. Building a chat application at the Leidsche Flesch with Vert.x and MongoDB. Short description of a Single Sign On implemenation based on Redhat JBoss EAP and picketlink. This presentation was an introduction to the Java Enterprise Edition 7 presentation of Arun Gupta. Detailed story comparing the similarities and differences between Java Enterprise Edition 6 and Spring Framework 3.